Antioquia is the largest department in the Andean region of Colombia and while the majority of its terrain is mountainous, it also encompasses regions of rainforest and dramatic Caribbean coastline. The following are some of the highlights in this wonderfully lush department divided by zone. Jardin is a delightful town in the far south of the department. It is nestled in green mountains and offers a relatively cool climate. However, the real treat of visiting this town is taking walks into the surrounding countryside. 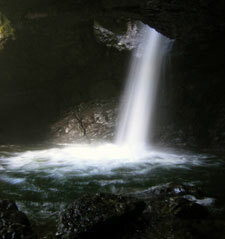 The most highly recommended walk involves a trail leading to a dramatic waterfall that falls through a hole in the rock above it. The trek is best done with a guide as finding the waterfall could be a bit tricky unless you know exactly where to look. The best place to hire guides is from the firestation in the centre of the town. The guide will generally take you part of the way by jeep. The walk itself takes a few hours, there and back, and includes a little bit of scrambling down some wet rocks to get to the waterfall, so bring some good footwear. The walk affords spectacular views back down over Jardin and the surrounding valleys and mountains. Buses leave from the Southern Terminal of Medellin and take around 4 hours. 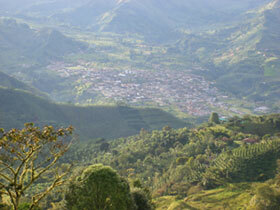 La Pintada is a beautiful town around 2 hours south of Medellin. It is a popular getaway for those in Medellin looking to escape the city during one of Colombia's many long weekends. The climate is hot and the majority of hotels in and around the town contain swimming pools to cool off in. 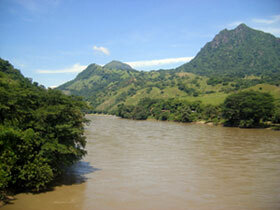 If hanging out poolside isn't really your thing, there is a pleasant walk that winds along the Cauca River. The river can be reached by crossing the bridge on the exit of La Pintada (away from Medellin) and turning right up a track. Also see my guide for things to do in the city of Medellin.